The obligatory sprint picture post... Alexander Schremmer, Armin Rigo, Maciek Fijalkowski, Antonio Cuni Anders Chrigström, Samuele Pedroni, Laura Creighton, Jacob Hallén, Carl Friedrich Bolz, Richard Emslie, Maciek Fijalkowski, Armin Rigo Holger Krekel Whiteboard with "real world goals" dependencies. 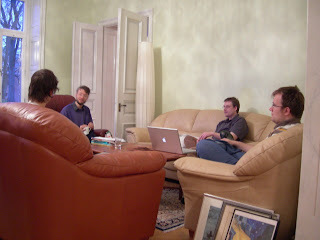 A more technical discussion during the sprint was about the next steps for the external module problem (minutes). One of PyPy's biggest problems in becoming more generally useful are C extension modules, which can't work with PyPy's Python interpreter. We already reimplemented many of the more commonly used extension modules in CPython's standard library in Python or RPython. However, there are more missing and there is no way to implement all the extension modules that other people have written. Therefore we need a different approach to this problem. Extension modules are commonly written for two different reasons, one being speed, the other being wrapping non-Python libraries. At the moment we want mostly to approach a solution for the latter problem, because we hope that the JIT will eventually make it possible to not have to write extension modules for speed reasons any more. 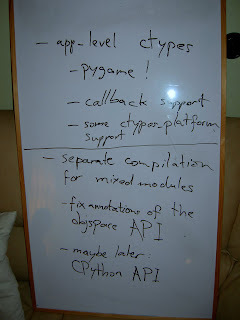 There are two rough ideas to approach this problem in the near future (there are other, more long-term ideas that I am not describing now): One of them is to add the ctypes module to PyPy's Python interpreter, which would mean re-implementing it since the existing implementation is written in C.
The other way would be to work on the existing way to get extensions in that PyPy provides, which are "mixed modules". 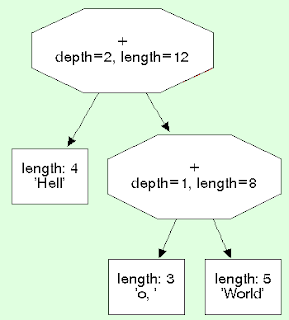 Mixed modules are written in a combination of RPython and normal Python code. To then wrap C libraries you would use rffi, which is the foreign function interface of RPython. The discussion round: Maciek Fijalkowski, Armin Rigo, Richard Emslie, Alexander Schremmer. Both approaches have problems: With ctypes you have no built-in way to query C header files for structure layouts and constants which requires you to hard-wire them, which is highly platform dependant. Mixed modules are not really fun to write, since they need to be RPython and we currently don't have a way to do separate compilation, so you always need to translate PyPy's whole Python interpreter to see whether your module is correct. In the meeting it was decided to first go for a ctypes replacement. The replacement would be written in pure Python, we already have a very thin wrapper around libffi which the new ctypes implementation would use. The goal to reach would be to get the pygame implementation in ctypes to run on PyPy. To make ctypes more useful in general to write this kind of wrappers, we will probably extract some code that we have already written for PyPy's own usage: it gives a way to write "imprecise" declarations ("a structure with at least fields called x and y which are of some kind of integer type") and turn them into exact ctypes declarations, internally using the C compiler to inspect the platform headers. After this is done we should approach separate compilation so that developing modules in RPython has a quicker turnaround time. This is somewhat involved to implement for technical reasons. There are ideas how to implement it quickly to make it usable for prototyping, but it's still a lot of work. As you can see, we are lacking in the Windows testing area, which is an even worse problem because none of the currently active developers has Windows as his primary OS. We should improve this by finding a Windows machine where the tests are run nightly and where we can log in to try bug-fixes quickly. The latter bit is important, we had a nightly windows test run before (thanks to Scott Dial) but it didn't help, because even if you tried to fix a bug you would have to wait until the next night to see whether it worked. Another very serious problem is that of aggregation: we have these various test runs that all have a web interface to check for errors but there is no easy way to find out which tests failed. You have to go to each page and even some sub-pages to see what needs fixing, which is a tedious process. The idea for solving this is aggregate all the available information into some sort of testing-entry-point page that gives a quick overview of the regressions that happened during the night. It's not clear whether we can achieve that with existing tools (buildbots or whatever), but we will investigate that. The discussion about releases was more on a fundamental and less on a concrete level (especially when it comes to time-frames). We discussed what it means to make a release, because obviously it is more than just taking an SVN revision and putting a tarball of it onto the webpage. During the EU period we were required to make several releases, but those were not really meant to be more than technology previews for the brave adventurers to try. In the future we have the goal to release things that are more stable and hopefully more practically useful. The plan is to use medium-sized Python applications that have a chance to run on top of PyPy because they don't use too many extension modules (web apps being likely candidates) and that have good unit-tests themselves. The first step would be to find some applications that fit this description, fix the bugs that prevents PyPy from running them and from then on run them nightly on one of the testing machines to check for regressions. 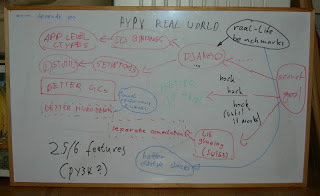 This would allow us to be more confident when stating that "PyPy works". Another thing to keep in mind for releases is the special features that our Python interpreter provides (e.g. the thunk and the taint object space, our stackless features, transparent proxies, sandboxing, special object implementations). Those features are neither tested by the CPython tests nor by any existing applications. Therefore we cannot really be confident that these features work and don't have too many bugs (in fact, the first time somebody really use the become feature of the thunk space in earnest he found a serious bug that is not fixed so far). To get around this problem, we plan to write small-to-medium sized example applications for each of these features (for stackless we can maybe use one of the existing stackless examples). This will hopefully find bugs and will also make it possible to evaluate whether the features make sense from a language design point of view. A minor thing to make releases easier is to be able to not only have the tests be run once a night but also be able to trigger them manually on the release branch before doing the release. Since we decided that the releases we make should be stable and usable, we also discussed how we would go about making new "cool things" like features, experiments etc. better known. The consensus was that this blog is probably the best forum for doing this. In addition we discussed having a stabler snapshot of the trunk made to ensure that people wanting to play around with these features don't accidentally get a broken version. 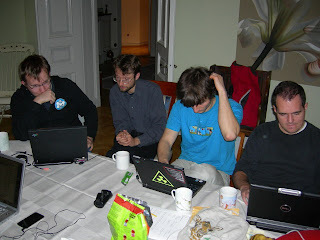 Right now we are still in cleanup mode (the cleanup sprint is nearly done, but we haven't finished all the cleanups yet), so we won't be able to start on the above things right now. However, they will have a strong focus soon. So if you are interested in trying out to run programs on top of PyPy or writing new ones that use the new features you are most welcome to do so and we will try to fix the bugs or help you doing it (of course some tolerance against frustration is needed when you do that, because the bugs that turn up tend to be obscure). We have not been perfect at this in the past, but this will have to change. >>>> u = "a" * 100000000 + u"\uffff"
I am not completely certain how useful this behaviour is for real-life applications, but it's kind of cool :-). It saves memory for european languages that contain few non-ascii characters. Of course there is at least one down-side to all of this, which is that string indexing is not O(1) any longer, because we have to walk down the tree to find the correct leaf where the character is actually in. I have not measured much, but I expect it to be quite fast in practice, because the trees are never deeper than 32 nodes. 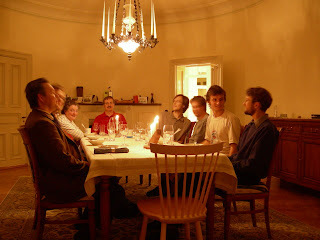 The following week we will have a sprint in Gothenburg to clean up the PyPy codebase and make it ready for future developments. So far, only a few people are here, the others will arrive this afternoon. 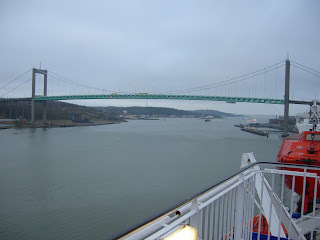 The Älvsborgsbron in Gothenburg from the ferry I took to get there. The past two days at IBM, in New York, have been quite interesting. The place is a research center. Feels University-like, but meetings rooms have no windows and climatization fixed on "polar" settings. The building is of course heated at this time of the year, and then the meeting rooms are climatized... I guess that just doesn't make sense to me. 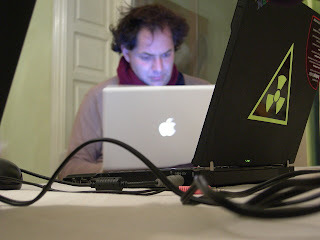 I think that both us and most of the people we talked with got interesting things out of the meetings. On our side, let me point a few highlights. We asked two people that worked on the GCs for the Jikes RVM if reusing them for RPython programs would make sense. They didn't scream "you're mad! ", so I guess the answer is yes. Apparently, it has been done before, too. I'm still not sure I got this right, but it seems that Microsoft paid someone money to integrate them with Rotor... Then the real-time garbage-collection guys explained to us the things that we need to take care about when writing a VM: real-time GC needs not only write barriers and read barriers, but pointer-equality-comparison barriers... They have bad memories of trying to add a posteriori this kind of barrier into existing VMs, so it took us a bit of explaining to make them realize that adding new kinds of barriers is mostly trivial for us (I'm still not 100% sure they got it... bad memories can stick hard). Then we had discussions with JIT people. Mostly, this allowed us to confirm that Samuele has already got a good idea about what Java JITs like Hotspot can do, and in which kind of situation they work well. As expected, the most difficult bit for a PyPy-like JIT that would run on top of a JVM would be the promotion. We discussed approaches like first generating fall-back cases that include some instrumentation logic, and regenerating code with a few promoted values after some time if it seems like it will be a gain. Replacing a method with a new version is difficult to do in a way that is portable across Java VMs. There are still possible workarounds, but it also means that if we really want to explore this seriously, we should consider experimenting with specifics VMs - e.g. the Jikes RVM gives (or could be adapted to give) hooks to replace methods with new versions of them, which is something that the JVM's own JIT internally does all the time.